The ongoing massive protests in support of Jallikattu in Tamil Nadu looks set to intensify with train blockades, worker strikes and continuing student protests state wide. The trigger for the stir to intensify was Prime Minister Narendra Modi's silence on the demand to promulgate an ordinance enabling the holding of the traditional bull-taming sport citing the matter as sub-judice. 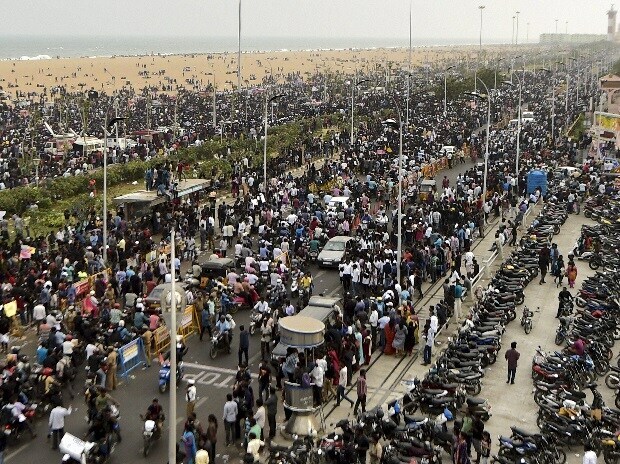 Around a lakh of youth gathered to protest in Chennai's Marina beach and also across the state and support for them is swelling. Associations representing truckers, retailers, private taxi operators, schools, have announced that they will not work on Friday. State government employees have decided to take out a procession. The movie industry has cancelled shooting and theatre halls would remain closed on Friday. On Thursday Tamil Nadu Chief Minister O Panneerselvam met Modi in Delhi and urged him to promulgate an ordinance. While Modi assured support to the state government's steps, he skirted the main demand citing the matter as sub-judice. "The ban imposed on Jallikattu by the Supreme Court came up for discussion. While appreciating the cultural significance of Jallikattu, the Prime Minister observed that the matter is presently sub-judice," the Prime Minister's Office said in a series of tweets. "The Centre would be supportive of steps taken by the State Government," it added. Panneerselvam said steps will be taken soon. "The state government will take necessary action in coordination with the central government to hold Jallikattu. The state government's action in relation with Jallikattu would soon be seen," he told reporters in New Delhi. 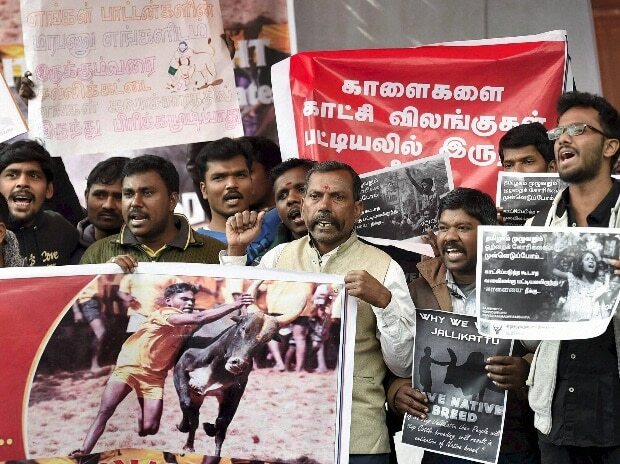 However, political parties and thousands of the protesting youth in Tamil Nadu were not amused with Modi's response to the Jallikattu ordinance request. DMK's Working President M.K. Stalin on Thursday said the party would hold protests on rail tracks across the state. Stalin, terming the situation in the state as "abnormal', urged Chief Minister Panneerselvam to call an all-party meeting during the day as well as a special assembly sitting on Friday over the burgeoning issue. The Chief Minister should also convene an all-party meeting, the DMK leader said. However, Panneerselvam remained silent on Stalin's demands. Stalin, citing Modi's assurance to Panneerselvam that the Centre will render all assistance to the state government on the Jallikattu issue, stressed that a special assembly sitting can take necessary legal steps for conduct of the ancient sport. PMK leader Anbumani Ramadoss, who was detained in Delhi for protesting outside the Prime Minister's residence, in a statement said his party would hold Jallikattu on Republic Day on January 26 in case the Centre failed to promulgate an ordinance to facilitate the hugely popular sport. PMK founder S. Ramadoss said Modi cannot wash his hands off citing the matter as sub-judice as there is no legal bar on the central government in coming out with an ordinance even when there is a court case. The Supreme Court in May 2014 banned Jallikattu, saying that bulls cannot be used as performing animals including in bullock-cart races. The common complaint among the protest leaders was that the Supreme Court had insulted Tamil culture by disallowing the traditional sport observed during the harvest festival of Pongal. In Tamil Nadu, the protests began on Tuesday morning following the arrest of protesters in Madurai district's Alanganallur town, well known for conducting the sport. In Jallikattu, a bull vaulter is expected to hang on to the animal's hump for a stipulated distance or for a minimum of three jumps by the bull. With several colleges declaring holiday here on Thursday and in other parts of the state, the number of students assembled at Marina went up drastically. PMK's Anbumani Ramadoss also said student and youth wing members of the party are participating in the protests. Karthikeya Sivasenapathy, managing trustee of the Senaapathy Kangayam Cattle Research Foundation (SKCRF), told IANS that the fight is not just for Jallikattu but the preservation of several native cattle breeds of many Indian states like Gujarat, Maharashtra, Madhya Pradesh, Andhra Pradesh, as well as sports like the Rural Olympics in Punjab. Himakiran Anugula, Secretary, SKCRF and an organic farmer in Tiruvallur district, said: "We do not need globalisation that ruins Indian villages and its environment. We carried out our campaign in favour of Jallikattu since 2013 and took it to the social media and to educational institutions." According to Anugula, the youth of Chennai had the experience of organising themselves using the social media when they faced the floods last year. "That experience is helping them now," he added.